spring cleaning! 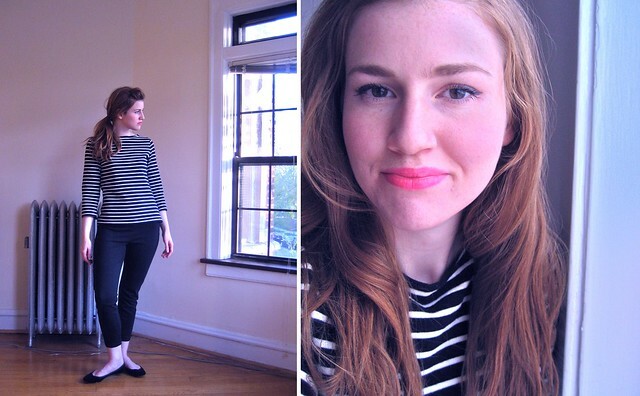 | Anna Allen Clothing Blog: spring cleaning! Hello everyone! It has been awhile since my last post during spring break. I've been home for awhile now and have been spending my time cleaning and de-junking this place. I feel like I haven't really devoted a good amount of time on this for a couple years. I've been through two moves in just over a year and every time I moved it felt kind of rushed. Also, since I am now only making my own line of clothing and have stopped sewing historical clothing, I want to get rid of extra fabric that has been sitting around for years. I can always buy fabric if I need it, but I hate having boxes and boxes of fabric that I'll never use. So now I have a pile of boxes in the living room that need to GO. I haven't figured out quite yet how I'm going to get rid of them. Might do a little yardsale online, but we'll see. Today I'm going to clean out the closet in my bedroom and probably make a pile of clothes to get rid of as well. Maybe I will have one big yardsale. ha! Maybe it's finally time I buy myself a little cart so it's not a pain every time I hike over to the post office. Anyway, it feels so good to finally get rid of things I never use or papers that I printed long ago and have forgotten about. Having a clean place means I am more productive and a lot more happy. So I'm being ruthless with my stuff and getting rid of as much as I can. In other news, I bought myself a new brightly colored lipstick yesterday and I must say, I think I've found my favorite lipstick! It's called "Love That Pink" in the Moon Drops line, by Revlon. It's the classic line that has been around for years and I know why! It goes on perfect and stays in place, which is a must for me, since I really haven't had a lot of experience wearing lipstick in my 27 years. :) But I want more experience with it, since I just love how it looks! It's so classic and makes me feel so pretty. That saying really is true; if you're feeling a little down, just go pick up a new lipstick and "voila!" all is well again! I think my next lipstick purchase will be from this same line. They have some really fun colors like "Persion Melon" (I've heard this is the official Pan Am girls lipstick color) and "Orange Flip". Yum! In other news, I have been really itching to sew some clothes for myself lately. It's been far too long since I've sewn clothing for my own wardrobe. So I'm thinking a lot about that. Maybe I'll do more outfit posts on here. I need to find a better place to take pictures, though. The radiator just is not very pretty. So hopefully I'll be posting more of my own sewing adventures and not just my shop sewing! Speaking of the shop, I have the spring line all ready, but I wanted to take a little break to clean the house, which is why I'm keeping it to myself for a bit. Also my brother John is helping me clean up my website and make it look sleek and pretty. But I think you will like what I have for spring and summer. I even have a little special something to share that my brother John put together. Can't wait to show you! More on that soon! yes, its that time of year for spring cleaning! I desperately need to do the same thing. Im thinking I'll make a pile of old artwork and tell my friends to come take what they want! Its so easy to gather clutter, isnt it? The lipstick looks great! I've been into peachy tones myself. Its so fresh and pretty. Heather, It really is easy to gather clutter! I feel better when I can give some of my things away rather than throw them out. But sometimes all I want to do is just dump it all in the trash and be rid of it! gahh. This is why I vow to become better at keeping my things under control and get rid or give away when I find I don't need something. That colour is so beautiful on you. It is like springtime in a lipstick! 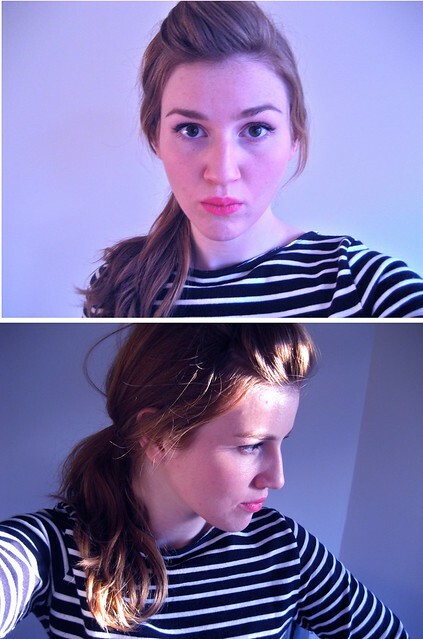 I recently found my perfect lipstick but, rather un-yummily, it is called 'true beige'. We are in the midst of packing all our belongings, accumulated over four years. It is so liberating to be free of many of them, isn't it? Why do we let them into our house to weigh us down :-) ? I clicked through to those shoes and there are no reviews. How do you like them? Karinalane, I do like them, but here is the problem. My left food is a bit smaller than my right (I think this is pretty common) and I first ordered the size 8, since I usually wear 8 without socks and 8.5 with regular street shoes. But those were like flip flops on my feet, so I gave them to my sister and ordered the 7.5. They fit, but a bit tight, so I filled some ziplock bags with water and inserted them into the shoes and stuck them in the freezer over night. I then continued this process again on the right shoe. 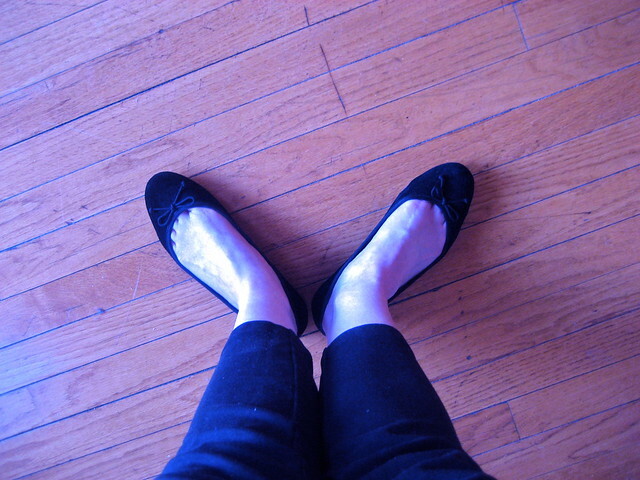 Now they fit pretty well, but I think the right foot needs to be made just a smidge larger. Anyway, all that said, if you have normal feet you probably don't need to go through everything I did! But they are really lovely shoes and amazing for the price! Hope that helps and isn't too confusing! That lipstick is so pretty! I know what you mean about not having a lot of experience wearing lipstick - I'm still trying to get used to not being able to rub my lips together as messily as you can with lip gloss. Please do share outfit posts, especially if you sew some clothes for yourself. I'm just teaching myself to sew and have been digging into blogs to see what other people make for themselves and the thought process behind it. AND, can't wait to see your spring collection, but I CAN wait, if you know what i mean. PS Oh, your hair. It is such a pretty color. Lovely. I love this lipstick on you. And the simple outfit is adorable. nice lipstick! Looks so classy with the stripes, too. I found you thanks to Pinterest. Your so pretty and your blog is so cute, smart and inspiring that I'm very happy to know you! My only question is : how can I follow you :) ? I think this color is so much fun on you! I will have to check out this line of lipsticks as I am a sucker for a new lipstick and these sound perfect. wonderful to give everything a good rout and just clean house! I think it's spring induced cause I just did the same thing with my sewing stash! Excited to see your spring collection.